Paper currency originated in China over a thousand years ago. Nowadays it is used all over the world and is gradually being replaced by debit and credit cards, e-payments, and polymer banknotes. This page focusses on the process of printing currency. As you can imagine there aren’t that many facilities that are allowed to print currency. This always happens either in a state-owned printing plant or one that is supervised by the government. Euro banknotes are printed by a number of national banks but also by certified printers, such as Royal Joh. Enschedé, (Haarlem, Holland), F. C. Oberthur (Chantepie, France), De La Rue (Gateshead, UK) and Giesecke & Devrient (Munich & Leipzig, Germany). 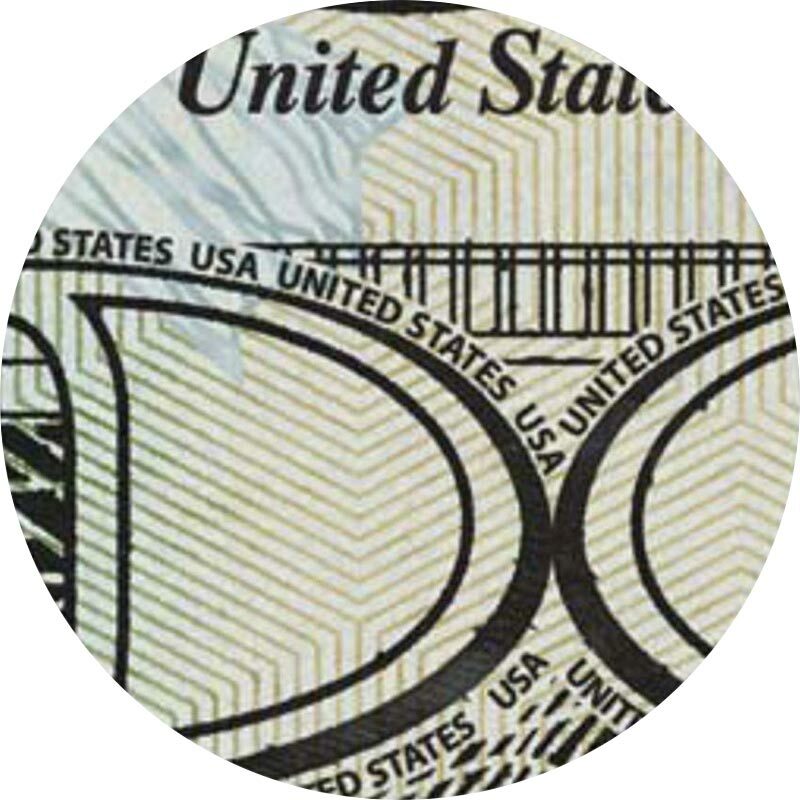 In the USA, all paper money is printed by the Bureau of Engraving and Printing in two production facilities in Washington, D.C., and Fort Worth, Texas. The Bureau is part of the Department of the Treasury of the federal government. British banknotes are printed by De La Rue, a British company with several production facilities in the UK for printing currency, passports, tax stamps, cheques and other secure documents. Indian currency is printed by SPMCIL or Security Printing and Minting Corporation of India Limited. Chinese banknotes are printed by Banknote Printing and Minting Corporation (BPMC), the largest currency printer in the world with 18000 employees working in 10 production sites. BPMC also printed or still prints banknotes for Bangladesh, Brazil, India, Malaysia, Nepal, Poland, Sri Lanka and Thailand. Banknotes are not printed using the same type of paper that is used for magazines or newspapers. They are printed on a substrate that consists of purely cotton (e.g. the Euro banknotes) or a mix of 75% cotton and 25% linen. Additional materials are often added as a security measure. These can be colored fibers or a security thread made of metal or a polymer. Plastic banknotes are more durable since they are more difficult to tear and more resistant to folding. The notes repel dirt and moisture so they don’t soil as easily. The polymer is also more resistant to micro-organisms. Because bi-axially orientated polypropylene (BOPP) is more rigid, the banknotes work better in ATMs and automated sorting operations. Plastic currency is up to twice as expensive to produce but the bank notes last two-and-a-half to four times longer than notes printed on cotton paper. The notes can be recycled so there is also an ecological advantage. The new banknotes are more difficult to counterfeit. In Canada, a pioneer in the use of synthetic currency, the number of reported counterfeits dropped by 74%. In 1982 the American Bank Note Company printed the first plastic banknotes using DuPont’s Tyvek polymers. Australia was the first country to use polymer notes for general circulation from 1992 onwards. In June 2016 the Bank of England introduced its first banknote printed on a polymer substrate. 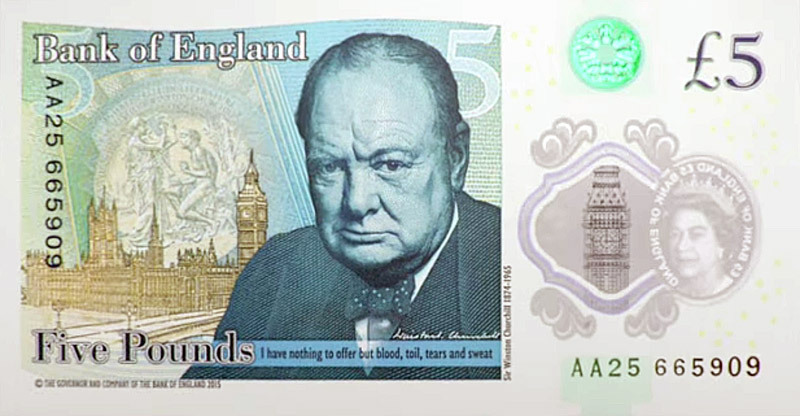 The five-pound note is called ‘The New Fiver’ and features a portrait of Winston Churchill. The new notes are printed by De La Rue, as can be seen in this ‘Making of’ video. special papers – there are paper mills that uniquely produce substrates for printing money. The world’s first paper money was created in China during the Tang Dynasty (618–907) by merchants who wanted to avoid the heavy bulk of copper coinage. From 1023 onwards the Chinese central government produced their own paper money using woodblock printing. The first European banknotes were issued in Sweden by Stockholms Banco, the precursor to Sveriges Riksbank, the central bank of Sweden. Each note was signed by hand by 16 prominent and trustworthy officials, to overcome objections that paper money would lead to the downfall of the Swedish monetary system. Within months other European governments and merchants also issued paper money. A lot of the early notes soon devaluated because there was no legal framework to guarantee the value of the currency and almost everyone could issue banknotes. In 1695 the Bank of England was the first to initiate the permanent issue of banknotes. Initially these banknotes were handwritten but by 1745, standardized printed notes ranging from £20 to £1,000 were being printed. In 1862 the United States issued their first one dollar bill in order to make up for coin shortage and to finance the Civil War. Polymer banknotes were first developed in Australia. They were first issued as currency in 1988. The largest banknote ever was the Chinese 1 Kwan, printed in the 14th century, measuring 9×13 inches. The first US paper notes were printed in denominations of 1 cent, 5 cents, 25 cents and 50 cents. Apparently green ink was used on the first one dollar bill because it stuck best to the paper. Green is of course still used today in dollar bills. In 2014 2278400 one dollar bills were in circulation, which was close to 40% of all the bank notes. The average production cost of a US bank note was 10 cents. Bills are composed of 25% linen and 75% cotton. According to the US Federal Reserve, the average lifespan of a $1 note was just 18 months back in 1990. By 2012, it had grown to 70 months because the replacement rate was slowed down. A US banknote can be folded back and forth 4000 times before it tears. Follow the #MoneyFact hashtag on Twitter if you’re interested in all kinds of trivia about money. A list of companies that are allowed to print banknotes can be found on Wikipedia. Lots of images of security techniques can be seen in this glossary. hi there, Polish national bank informed that Polish banknotes are printed only in Poland. Info, that its otherwise was created by chinese journalist. Whether they do it on purpose or mistaken Poland for Holland (or sth else) again, stays a secret. May I ask you where can we get a real currency printing machine. What company name and address. We are a tribal Government. The equipment is so expensive and the entire process so complex that even a lot of large countries have their currency printed elsewhere. 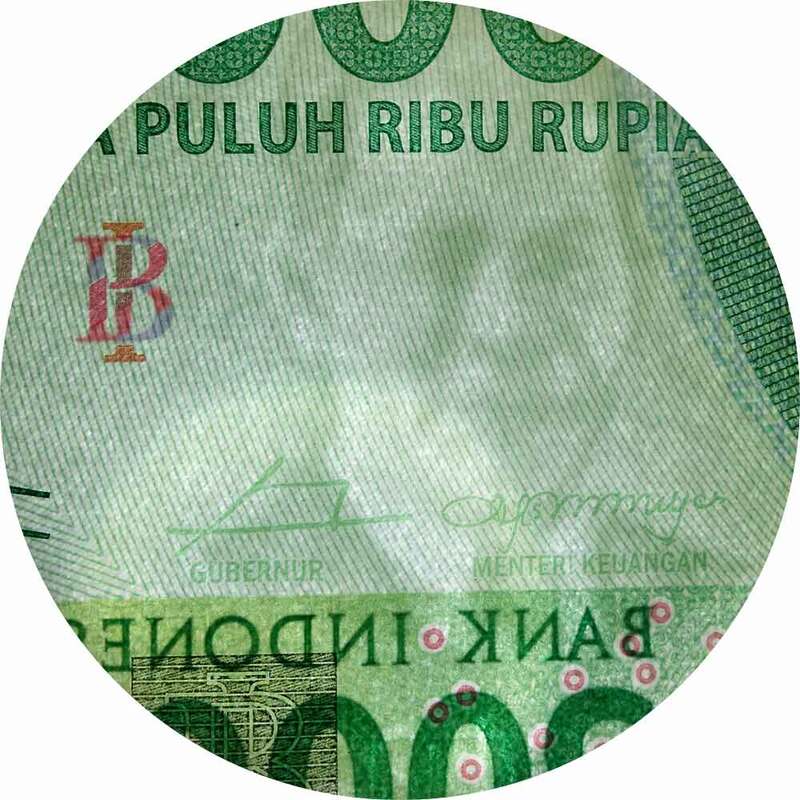 You can find a list of companies that print banknotes on Wikipedia.